How do I dispose of an unclaimed/abandoned vehicles? 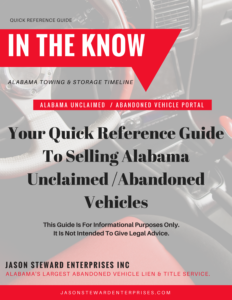 The State of Alabama now requires all vehicles within five (5) calendar days from the date the vehicle was first considered “unclaimed” by the person or entity in possession of a motor vehicle, the vehicle must be reported as “unclaimed” to the DOR through the Unclaimed/Abandoned portal. Once reported unclaimed to the DOR, intense owner / lien holder research is required to determine the last known owner and lien holders name and address for the notification of the vehicle. This may include using the National Motor Vehicle Title Information System (NMVTIS) to determine the State in which the vehicle is titled and/or registered. When the State of current title is located, a vehicle title record must be requested that will detail owner / lien holder information. Each request MUST be in consistent to the Driver’s Privacy Protection Act on the uses of the information requested. When the title record is received, within 5 days, you must send a Notice of Possession to the owner and lien holder of record. The owner and lien holder of record must be reported to DOR through the Unclaimed/Abandoned portal along with repairs, towing, daily storage rate and any other fees that is owed on the vehicle. 35 days after notice has been sent by certified mail the vehicle is considered abandoned and can be sold. Notice of Public Auction, the vehicle may be sold. 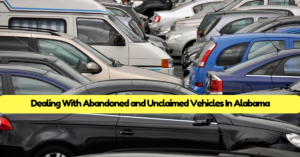 The abandoned vehicle bill of sale will be generated from the Unclaimed/Abandoned portal and will be used to apply for the Alabama certificate of title. All research documents, legal newspaper ads, certified mail receipts etc, must be kept by the seller for 3 consecutive years after the sale of the abandoned vehicle. Since we began serving Alabama in 2001, we have DEDICATED ourselves to YOU. We pride ourselves on having customer service that is SECOND-TO-NONE. Our customer-friendly environment offers you the support you need in all your unclaimed vehicles and title services! We do the work for you. Let’s face it: the paperwork used to file for an abandoned vehicles and title services can be intimidating. Not only is it long and complex, but the procedure can be costly. Don’t waste your time trying to do paperwork on your own! Our qualified abandoned and title service experts will work to get you the results you want! Our quality professionals understand the COMPLEX UNCLAIMED / ABANDONED LAWS that exist in the State of Alabama and FIGHT so that you WIN! Not only do we have a proven record of customer service, we also boast a RICH HISTORY of obtaining titles for abandoned vehicles. And, with three branches all across Alabama, we offer CONVENIENT ACCESS. Our locations give people across the State of Alabama a fair chance to have QUALITY title services. Don’t waste time by attempting to do it yourself: this can be expensive and may provide you with no results. Trusting our experts gives you the peace of mind you deserve, as we will use every means possible to meet your expectations. The benefits are clear! ← What is the purpose of NMVTIS?